The Hope bracelet (RFL edition) is on sale at the Inspired Dreamwalkers team store for 100L. Included is both a male and female bracelet and has easy fitting for any forearm type. All proceeds go directly to the American Cancer Society. 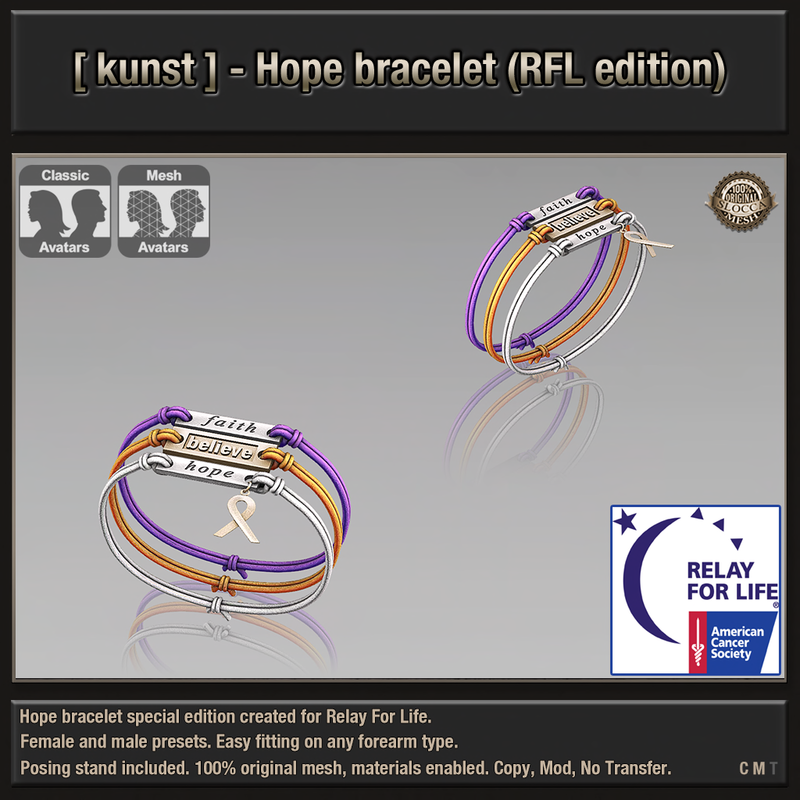 Special thanks to Kunst Himmel, owner of [ kunst ], designer of this special Hope bracelet to benefit Relay For Life. This entry was posted in American Cancer Society, Relay For Life of Second Life, Second Life and tagged ACS, American Cancer Society, Awareness, Cancer, Fundraiser, Fundraising, Inspired Dreamwalkers, Inspired Dreamwalkers RFL, Relay For Life of Second Life, Team, vendor, volunteer, [ kunst ]. Bookmark the permalink. 2019 RFL of SL: All Aboard! For A Cure! Gachas! At An Eggstra-Ordinary Event! An Eggstra-Ordinary… on An Eggstra-Ordinary Event!